In family court cases concerning the division of property when one spouse is institutionalized in long-term medical care while the other is not, a spousal assets form may need to be completed by one or both parties. This article discusses the North Dakota Spousal Assets form which should be filed in such cases. This form SFN 52 can be obtained from the website of the North Dakota Supreme Court. North Dakota Spousal Assets SFN 52 Step 1: At the top of the page, enter the name of the spouse who is in a nursing home and the name of the other spouse, known as the "spouse in community." Enter the Social Security number of the spouse in the nursing home. 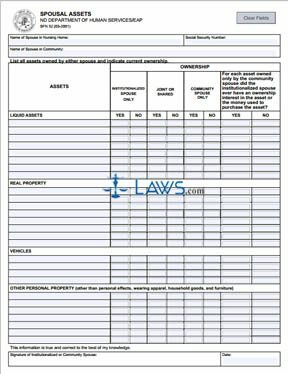 North Dakota Spousal Assets SFN 52 Step 2: You should list all assets as detailed and indicate with a check mark whether the asset is owned jointly or only by the institutionalized or community spouse. Indicate whether any assets solely possessed by the community spouse were purchased with funds including those of the institutionalized spouse or whether they ever had an ownership stake in it. North Dakota Spousal Assets SFN 52 Step 3: The first category of assets to list is "liquid assets," such as stocks and bonds. North Dakota Spousal Assets SFN 52 Step 4: The second category of assets to list is "real property," such as houses. North Dakota Spousal Assets SFN 52 Step 5: The third section of assets is "vehicles," such as cars and trucks. North Dakota Spousal Assets SFN 52 Step 6: The last section is for "other personal property," which does not include furniture, clothing and personal items. North Dakota Spousal Assets SFN 52 Step 7: Sign and date the form.